1. ALL the laundry. This is a very good thing. If I hadn't done laundry today my clothing options for tomorrow would have been a bathing suit or a cocktail dress. I hate using public laundry machines. You have to carry a heavy basket far, you have to scrounge quarters or make a special trip to the bank, and worst of all, you have to deal with jerky other people who leave their wet clothes in the washer for 3 hours before coming back for them... Gross dude. 2. The bathroom. It sparkles now. I scrubbed it. There was Commet and PineSol and Windex involved. My toilet needs maintenance (the tank won't stop running unless you jiggle the handle just right) but I felt like the bathroom needed a serious clean before allowing it to been seen by a stranger. No more tub ring. No more sink ring. No more little toothpaste specks on the mirror. It's almost like a adult lives here and not a 17-year-old girl. 3. Cumulonimbus. The last installment of the Stephen West Westknits Shawl Club came in April and it came off the blocking board this afternoon. This means I completed all five shawls, each within one month. 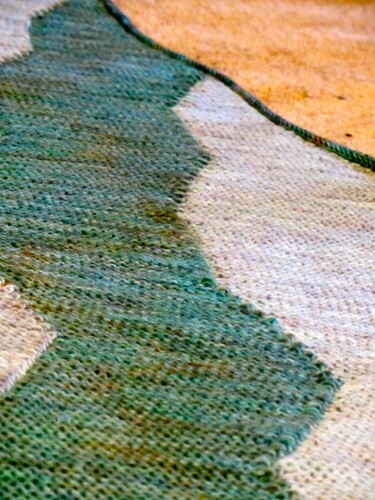 The pattern is basically vertical intarsia stripes. The shape comes from simple increases and decreases. It's was by far the easiest of the 5 shawls to make. The most difficult part was stopping ever few rounds to be sure the four strands weren't tangled. The yarn from this installment was Hedgehog Fibers Sock yarn. It's a basic merino nylon sock yarn blend. The colors were April Showers (light blue) and Fool's Day (dark blue). I find that it's wound a little loose to be good for actually making socks. In fact, I was really disappointed with the way this yarn was milled. One of my skeins was fine, but the other was plied so badly at the mill that there were many places where the plies had twisted back on themselves making thick rough spots in the yarn. 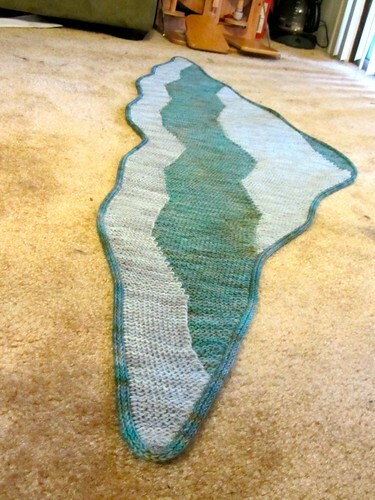 Now that it's knit up, you can't really see the flaw, but you can feel it when you run you hand over the project. I wouldn't choose to use it again. 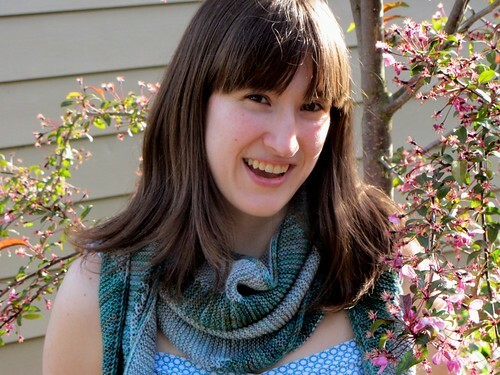 It was too warm to wear scarves/shawls today, but I managed to hang in there long enough to get this modeled shot. Luckily May in Portland is pretty fickle and I would bet the temps take another dive before it gets warm for good. Here's hoping I get to wear it at least once before next winter.